“The Military Police’s hunt for the head of drug trafficking in three large favelas in Itaboraí in the Rio de Janeiro metropolitan region had a happy ending. On Aug. 31, police officers arrested Bruno “Boldinho” Pacheco Lima, 25, after nearly a year of investigations. Boldinho, who is an alleged member of the Comando Vermelho criminal faction, has been identified by police as the head of drug trafficking in the region. He had eight warrants for his arrest and is accused of murdering a 17-year-old girl during a funk party in late 2012. Boldinho is behind bars with quite a few of his colleagues, as there never have been as many drug dealers in prison as there are now in Brazil. The 138,198 inmates held on drug-trafficking charges account for 25% of the overall prison population. And this number has been increasing disproportionately, according to the most recent survey by the National Penitentiary Department (DEPEN), which was completed in December 2012. The number of inmates held on drug trafficking charges has increased 30% during the past two years, from 106,491 in 2010 to 138,198 in 2012. During the same period, the overall prison population increased just 10%, from 496,251 to 548,003. Brazil’s secretary for National Drug Policy, Vitore Maximiano, said the change in the country’s Anti-Drug Law is one of the main reasons behind the higher number of narco-trafficking arrests. Brazil’s Anti-Drug Law, which was passed in 2006, increased the minimum sentence for drug trafficking to five years, with the maximum sentence 15 years. In the previous version of the law, which was passed in 1976, a drug trafficker could be sentenced to a minimum of three years and a maximum of 12 years. However, neither version of the law includes prison sentences for drug users. Another reason behind the increase in the number of inmates is the intensification of public safety operations in drug-dealing areas and an increase in the overall police presence on the streets. Maximiano also points out that there is a loophole in the new law that is contributing to an increase in the number of people behind bars: Brazilian law does not include clear criteria for differentiating between drug users and drug traffickers. In the United States, the amount of drugs in an individual’s possession when they are approached by police is crucial in making this distinction. In Brazil, the amount of drugs held by an individual is not a determining factor in and of itself. The officer in charge must determine whether the amount apprehended is intended for personal use or trafficking. Brazil’s former National Anti-Drug secretary, Walter Maierovitch, also points to intelligence work as an essential component to winning the fight against drug trafficking. He noted the volume of drugs seized has little to do with an individual’s potential involvement in trafficking, arguing the person’s economic and social status also must be taken into account, as well as the situation in which the drugs were found. Maierovitch added a global effort is needed to end the drug trade, given these criminal organizations increasingly have international connections. He estimates that only 3% to 5% of the world’s narcotics suppliers are being apprehended. On the domestic front, there are no accurate statistics regarding the connection between the arrest of drug traffickers and reductions in drug consumption, as Maximiano said more needs to be done in Brazil. Judge José Muiños Piñeiro Filho of the 2nd Criminal Court of Justice of Rio de Janeiro said the lack of criteria for differentiating between drug users and drug traffickers, together with the lack of investigations, contributes to the increase in the number of inmates held on drug-trafficking charges. Piñeiro Filho pointed out the current law allows for the sentence to be reduced when dealing with a first offense committed by an individual with a clean record, with no ties to organized crime. But cases such as Boldinho’s are the exception. Piñeiro Filho emphasized drug traffickers who are being arrested are, in most cases, further down the narco-trafficking hierarchy. “They’re generally easily replaced within the organization. As a result, arresting them has little effect on organized crime,” Piñeiro Filho said. According to Piñeiro Filho’s calculations, about 35% of the cases he handles are related to drug trafficking and many involve young people. This is reflected in the overall prison population. 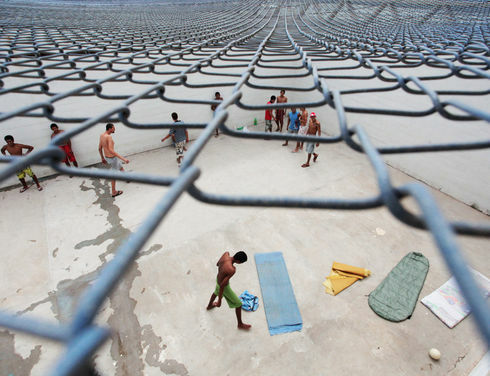 The average age of inmates in Brazil is now 26, 10 years younger than it was 30 years ago. The three experts agree that to combat organized crime and change the reality of the Brazilian prison system, more investments are needed in prevention and the treatment of drug users as a public health problem, not merely a public safety issue.